Plot: A humorous take on Sir Arthur Conan Doyle's classic mysteries featuring Sherlock Holmes and Doctor Watson. Starring: Ralph Fiennes, John C. Reilly, Will Ferrell, Kelly Macdonald. 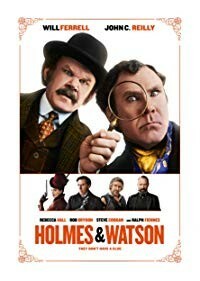 distributed by Sony / Columbia «Holmes and Watson» in the US movie theaters released on December 25, 2018 and has grossed over $40 million worldwide; dvd and blu-ray release date was set for April 9, 2019. Rent from Netflix and Redbox from April 9, 2019. «Holmes and Watson» in the UK released in movie theaters on December 26, 2018. DVD and blu-ray release date scheduled for May 6, 2019.